* Richard Colvin Reid was born on 08/12/1973 in Bromly, south London, to an English mother and a Jamaican father. At the age of four his parents divorced and he stayed with his mother. In his teens Richard Reid was a small street offender and seat several times in jail. At age of 16, in 1989, while in Feltham Young Offenders’ Institution, Richard Reid convert to Islam. After converting to Islam, Richard Reid used to pray in Brixton Mosque in south London and adopted a Muslim nameof Abdel Rahim. There, in Brixton Mosque, Richard Reid met for the first time with Zacarias Moussaoui . Richard Reid became more and more militant and eventually, in the mid 90Th, moved to the Finsbury Park Mosque , run by the radical Imam Abu Hamza al-Masri. In 1998 Richard Reid ceased to show up in the Mosque and it was thought that he went to Afghanistan. He also lost contacts with his family. It is later known that during this time Richard Reid traveled 7 countries using different names and passports, one of them was Abdul Rauff. It is not known from where Richard Reid got the money and the passports but it is logical to assume that the first contacts were made in Finsbury Park Mosque. In 07/07/2001 Richard Reid came to Israel with a flight from Netherlands with a new passport after he claimed to have ruined his old passport in his washing machine. Richard Reid visited different places in Israel and before leaving for Egypt he stayed few days in Gaza Strip and was hosted by Nabil Abu Oqel s’ family. During the flight from Netherlands to Israel and until he left to Egypt Richard Reid was under close surveillance of the ISRAELI security service – Shin.Beit. From Egypt Richard Reid flew to Turkey and Pakistan, probably was briefed in Afghanistan, and flew back to Netherlands on 08/09/2001. Richard Reid spend time between Brussels and Paris and had a new passport issued in the British embassy in Brussels on 12/07/2001 under his partial name – Colvin Reid. On the morning of 12/22/2001 Richard Reid boarded flight 63 from Paris, France, to Miami airport, USA. In the middle of the flight Richard Reid tried to detonate a small bomb hidden in his shoe heel while seating near the window. Because of chemicals’ problem he failed to detonate the bomb and was overcome by the crew and passengers of the flight. Later the USA authorities found out that the bomb was made with a small amount of industrial plastic explosive and the detonator that failed was a home made Triacetone Triperoxide. On 01/30/2003 Richard Reid was sentenced to 30 years in prison on 4 counts to be served consecutively, which means that he will be the rest of his live in jail. * Richard Reid was not the 20’s hijacker of The 9/11 but, maybe, a part of an attempt to wage a second wave of attacks on Western commercial aviation. * On 11/27/2003 in Gloucester, UK, a similar shoe bomb was found and a man with connection to Richard Reid, Sajid Badat , was arrested. 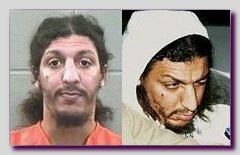 * Although Richard Reid was known as an Islamic militant that traveled all over the world without any known income, had the tendency to lose his passport too many times, was well known to the ISRAELI intelligence, and therefore also to other Western agencies, still after The 9/11 Richard Reid managed to board flight 63 and only a chemical failure prevented a major catastrophe. Richard Reid was said to have been influenced by Tablighi-Jamaat.